Have you ever dreamed of being married in a cozy cabin, with snow falling outside and loved ones sipping hot chocolate? Or perhaps your ideal wedding day is popping a bottle of champagne and bringing in the new year as husband and wife? 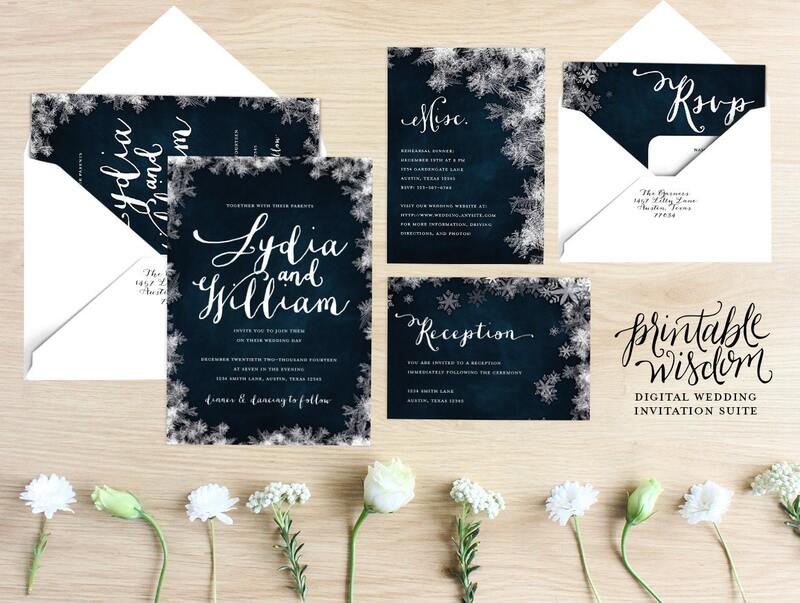 We’re gearing up for the winter here at World Digital, because it’s time for all of our winter brides to begin thinking about their invitations! We’re also running a special from now through the end of September for November, December, or January brides. If you’re having your wedding over the 2016-2017 Holiday Season, schedule a consultation with one of our designers before September 30th and receive a 25% discount on your invitation sets! So for your inspiration, we’ve collected 11 of our favorite winter wedding invitation pins that are perfect for winter nuptials. No matter what your perfect winter wedding is, there’s sure to be an invite her that’ll make your celebration that’s merry and bright! Just because there’s snow on the ground doesn’t mean your wedding can’t have gorgeous floral elements! In fact, some of the most dramatic and beautiful flowers are featured in winter weddings, and the invites below are no exception! 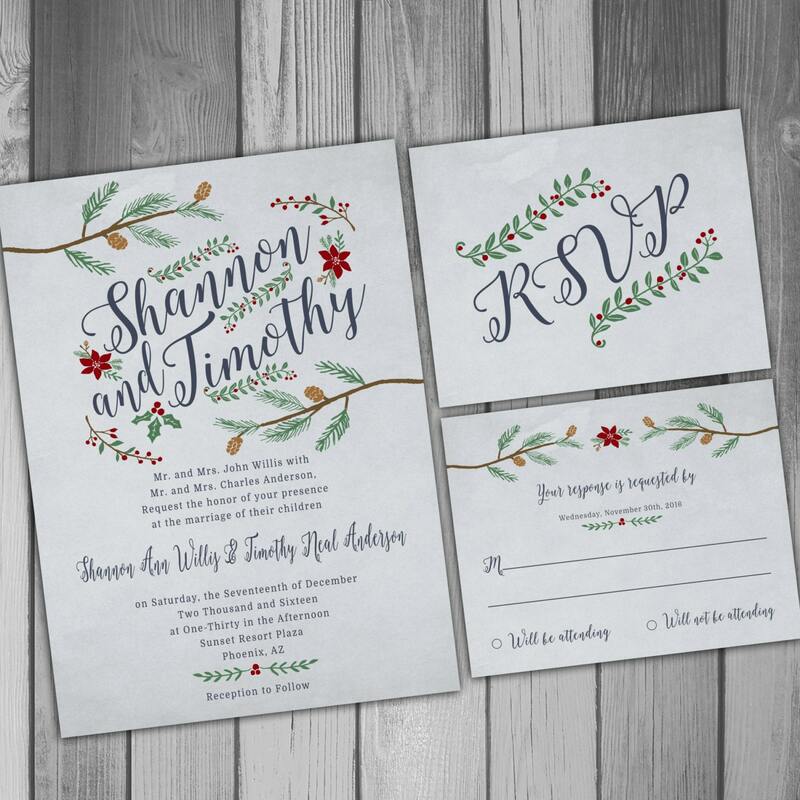 These gorgeous rustic invites feature pine branches and holly leaves, perfect for any wedding over the Christmas Season! And we love how they incorporate a touch of Navy as well, for a modern twist! 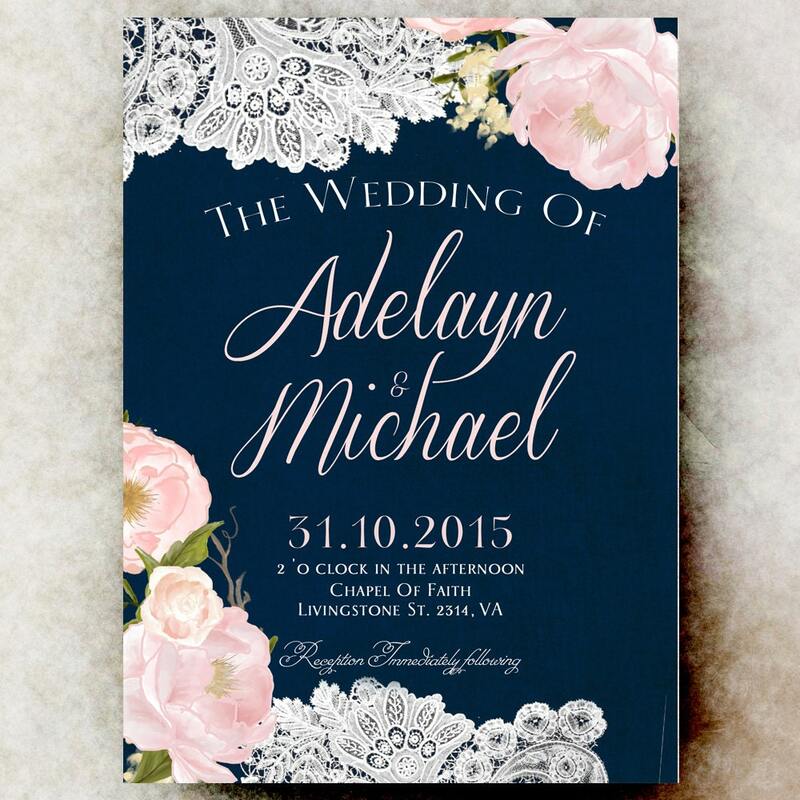 Soft, pale colors like the flowers on these invitations are perfect for the winter season. A touch of lace evokes the feeling of snow and adds a touch of elegance. These invites may not be a “traditional” choice for a winter wedding, but we think they’d be perfect for an elegant holiday fete! Who doesn’t love Poinsettias? 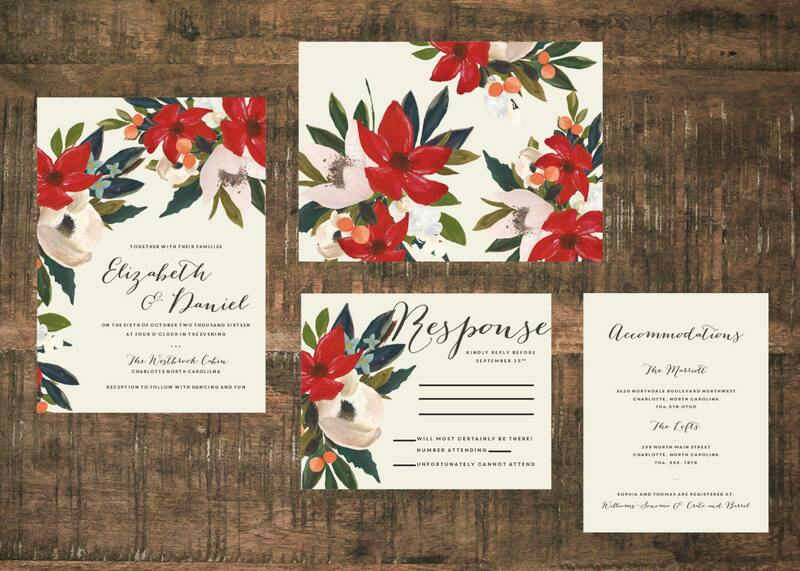 The signature flower of the holiday season, their vibrant red adds a bold, sophisticated look to any invitation. Go a little more rustic with touches of wood! 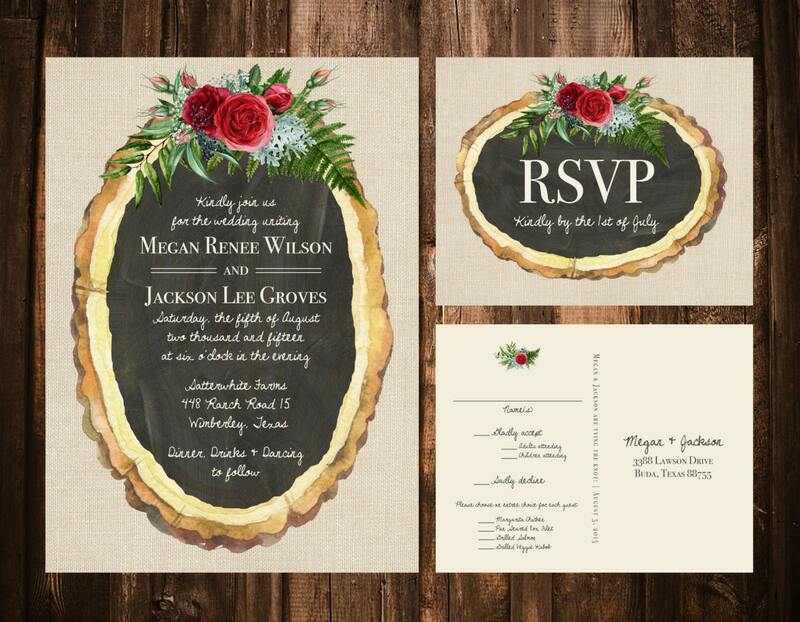 These wood slice invites add a warm, natural feel to take away the chill! And we love the postcard-style RSVP card included with the set! For a classic look, go no further! Snowflakes and frost are a winter trademark, so it’s only natural to incorporate them into your invitations. Here’s a few of our favorite snow-themed winter wedding invitations! The frosted edges and dark backgrounds of these invitations from PrintableWisdom are elegant and modern, with just a hint of a nod to tradition. Falling foiled dots imitate the look of snow, and add a beautiful shimmer detail to these invitations from Wedding Paper Divas. Metallic accents add a sophistication to your invites that is perfect for a winter hotel or ballroom wedding. 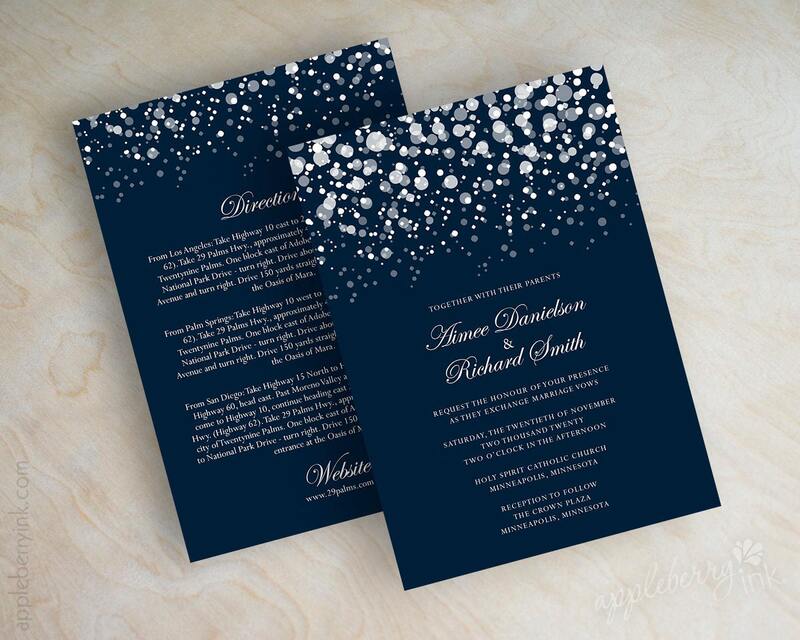 Similar to the last invites, these feature falling polka-dots on a dark navy background that evokes the feel of watching snow drift down on a winter night. A remote mountain cabin, a flannel blanket, and a warm fire. 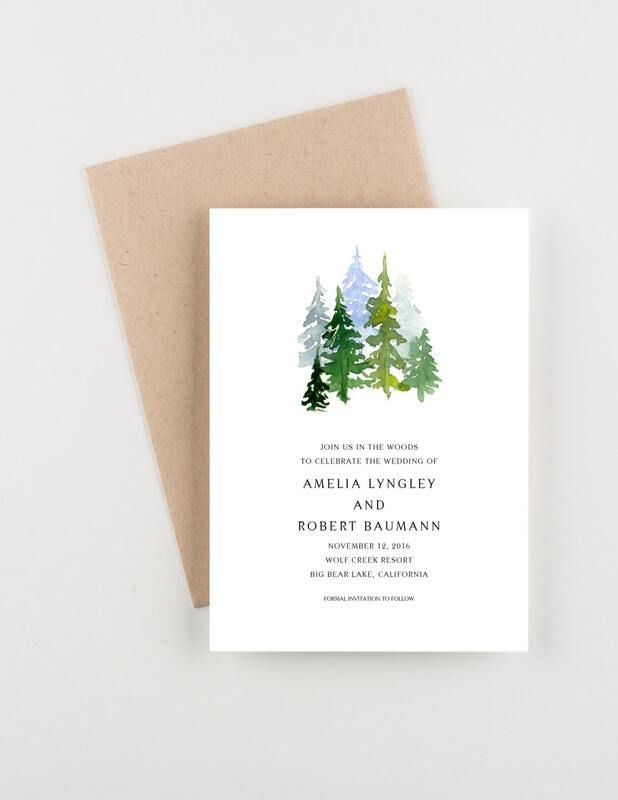 Get cozy with these invites that evoke the more natural, woods-y feel of winter. Pine trees fading off into the distance on a stark white background? This is the perfect winter wedding invitation for a bride who dreams of being married in the mountains. 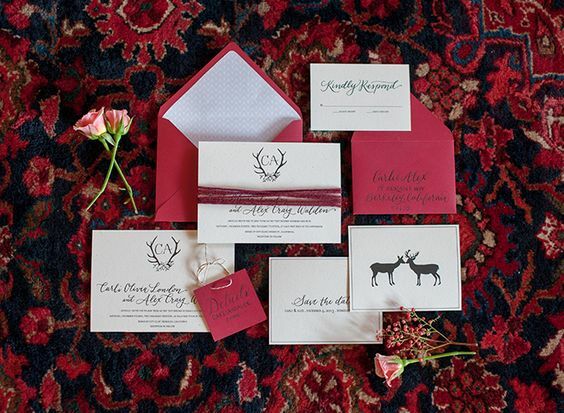 Burgundy accents and reindeer antlers make this winter wedding invitation suite warm and inviting. These invitations give you a cozy rustic feel that is perfect for a cabin-in-the-woods wedding! Watercolors are always in season! Whether it’s painted florals or bold washes of color, watercolor invitations are a trendy and elegant touch for any wedding! A cool color palette of soft blues and purples, and a motif of stringed lights makes this watercolor invitation a unique choice for winter weddings. This design makes us think of New Years’ Eve, so pop some bubbly and ring in the new year!